Irish Sports Minister Shane Ross says ongoing concerns about the Football Association of Ireland's corporate governance could see it becoming ineligible for capital sports grants. 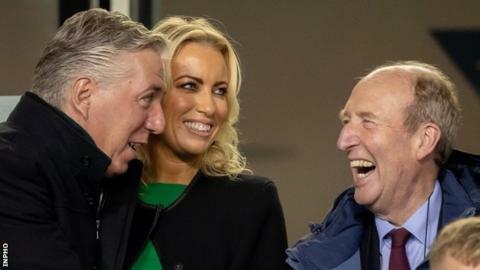 Amid the controversy over a 100,000 euro loan given by ex-FAI chief executive John Delaney, Sport Ireland last week suspended funding to the FAI. Ross' comments now centre on funding for infrastructure projects. "They haven't answered the questions on corporate governance," Ross told RTE. "We have to look at how they are actually running this sporting body. "If they [the questions] are not answered, we'll take the necessary action. "The necessary action is not only with the sports grants which have already been frozen but we will rule out anybody who isn't in good stead in corporate governance from getting large capital sports grants. "We are talking about large amounts of money for which the FAI would [normally] be included and for which they would be interested. "They will not get money if they are not in good standing on corporate governance." Following the revelations last month about the 100,000 euro loan which Delaney gave to the FAI in April 2017, the then FAI chief executive was moved to a newly-created role of executive vice-president. Delaney and other FAI official appeared before an Irish parliamentary committee hearing last Wednesday. The former FAI chief executive told the hearing that he had given the Irish football governing body the loan so that it could avoid exceeding its overdraft limit. However after giving his initial statement to the committee, Delaney said that he was unable to answer questions on the loan or the finances of the governing body following legal advice. On Thursday, two FAI sponsors released statements called on the governing body to adopt all of the recommendations arising from their own internal investigations into the association's finances and systems of governance. In response to the sports minister's statement, the FAI on Sunday evening said it was taking "many urgent steps" to address governance and financial issues. "The board of the Football Association of Ireland notes the comments made today by the Minister for Tourism, Transport and Sport, Shane Ross, and by Deputy Fergus O'Dowd, chairman of the Oireachtas Committee on Sport," said the FAI statement. "The Association wishes to assure all parties that it is taking many urgent steps to address its current governance and financial issues. The board of the Association will meet again tomorrow [Monday] to review these steps."